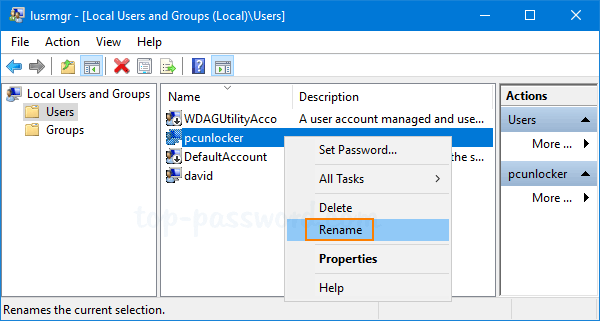 How do I change Windows user name in CMD? Is there a simple way to change Windows username that appears on the sign-in screen? 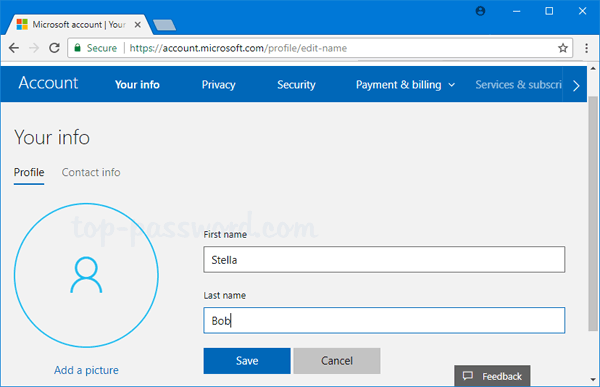 This tutorial shows you 6 ways to change user account name for local account and Microsoft account in Windows 10. Note: After changing the account name, the name of your user profile folder (C:\Users\user_name) will remain unchanged. To rename the user profile, follow the method described in this article. 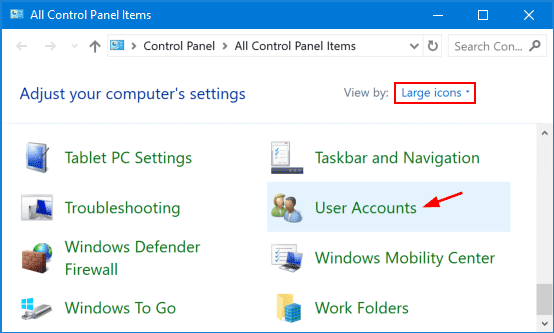 Open the Control Panel in Large icons view, and click User Accounts. Next, click on the “Manage another account” link. Click the local account you want to change the name of. Click the “Change the account name” link. Type in your new account name and click on Change Name button. 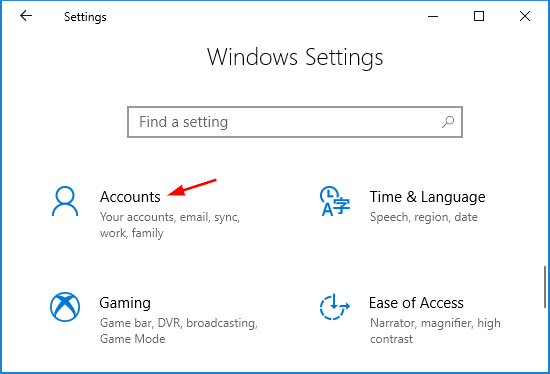 If you’re using Microsoft account for logging into Windows 10, you need to change your account name online. Just follow the steps below. 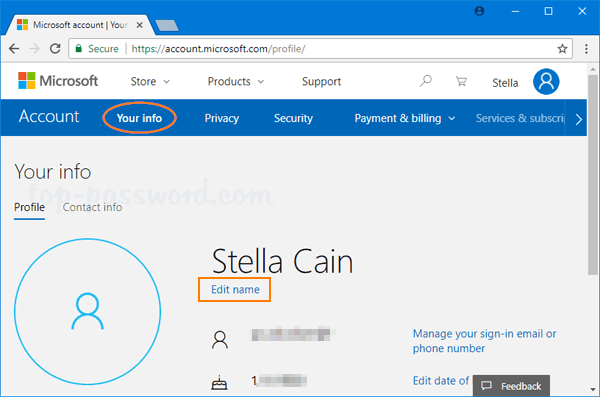 Open the Microsoft account page using your Web browser, and sign in to your Microsoft account. Select the Your info menu on the navigation bar at the top, and then click the Edit name link under your account name. Type a new First name and Last name, then click on Save. The next time you sign into Windows 10, you should see the new account name shown on the login screen. 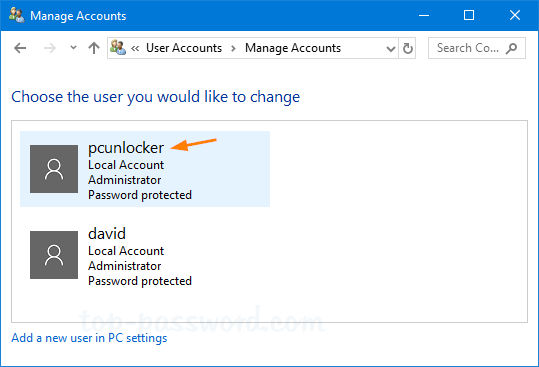 If the new username is not synced to your computer, try to switch your Microsoft account to a local account, and then switch it back. Open the Local Users and Groups snap-in. To do this, press Windows + R keyboard combination and then type lusrmgr.msc then hit Enter. 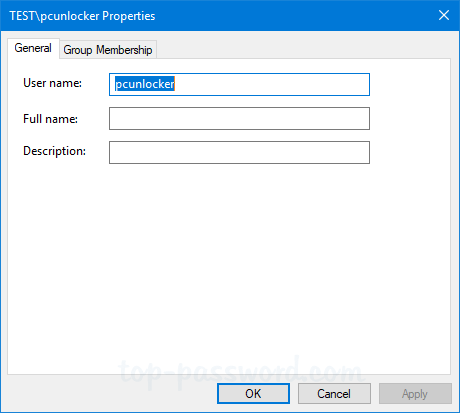 Expand “Local User and Groups” and select Users in the left pane. Next, right-click on the local account for which you want to change the username, and select Rename from the popup menu. Press the Windows key + R and then type netplwiz in the Run dialog box. Click OK. 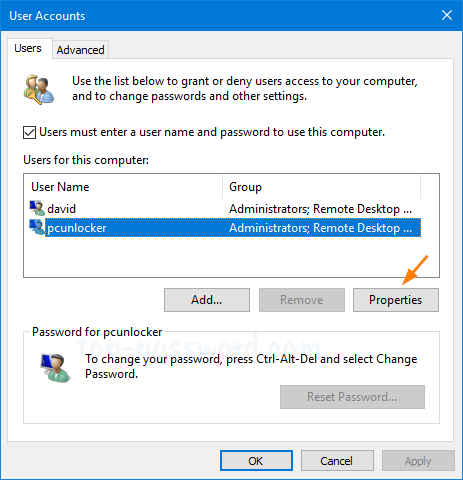 In the User Accounts window that appears, make sure the “Users must enter a user name and password to enter this computer” option is checked. Select the local account for which you want to change the username and click on the Properties button. In the General tab, type in the new username for the account then click OK.
Open the Command Prompt as administrator. In order to change your Windows username, type the following into the Command Prompt and press Enter. 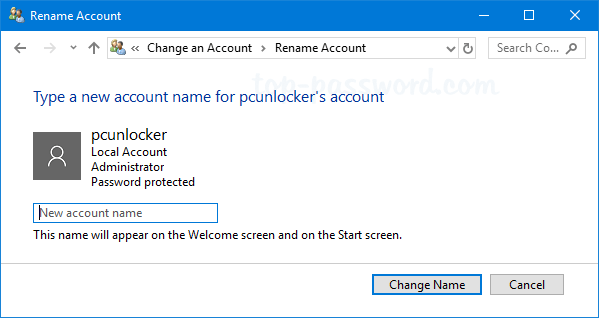 wmic useraccount where name="Current Name" rename "New Name"
wmic useraccount where name="pcunlocker" rename "tom"
When you’re done, reboot Windows and you can log in with the new username and old password. Rename-LocalUser -Name "Current Name" -NewName "New Name"
Close the PowerShell console and reboot your PC to apply the changes. Colors on your monitor look weird or is it darker than normal? If your monitor’s color and brightness are messed up, you can use the Color Management to calibrate your monitor by installing the proper color profile to help get more accurate colors. 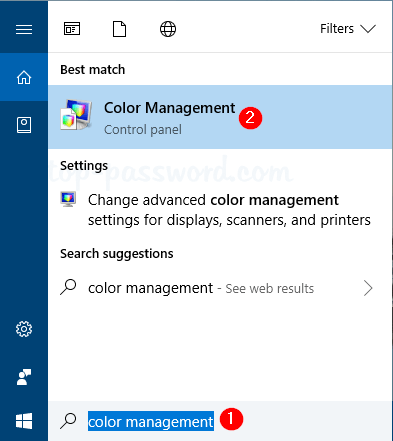 In this tutorial we’ll show you quick ways to open Color Management in Windows 10, 8 and 7. Click the Start button and then type “color management“, click on the Color Management shortcut that appears as the first result. Press the Windows key + R together to get to the Run dialog box. Type colorcpl and press Enter to launch Color Management. Open the Control Panel. Select Large icons from the “View by” drop-down menu on the upper-right corner, and you can then access the Color Management utility directly. When you’re at the Command Prompt, type colorcpl and hit Enter. This will open the Color Management window immediately. Another similar way is to run the same command in Windows PowerShell console. Calibrating your monitor is a simple task to help you make sure colors look as accurate as possible on your computer’s screen. 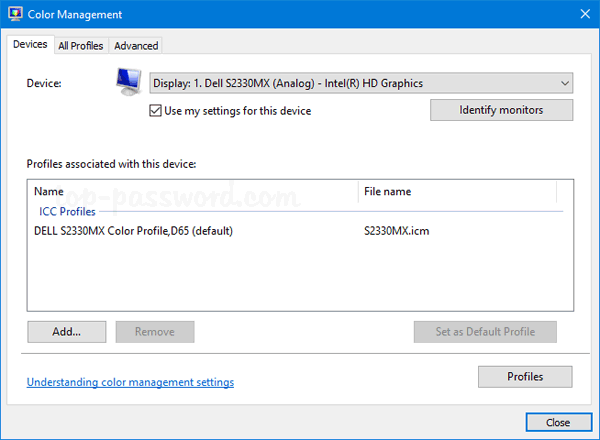 If you need to switch the color profile as often as you want, it’s necessary to create a desktop shortcut to access the Color Management utility (c:\windows\system32\colorcpl.exe). 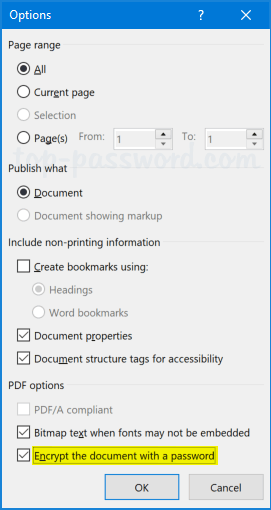 How can I password protect a PDF file without Adobe Acrobat? Since Microsoft Office 2010, it allows you to export a Word document to a PDF file or protect an existing PDF document with a password. 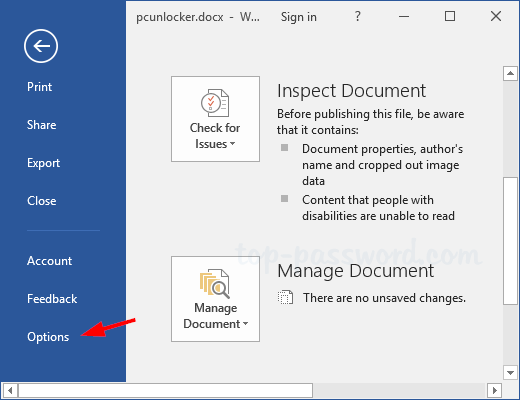 In this tutorial we’ll walk you through the steps to password protect a PDF document with Word 2016 / 2013 / 2010. 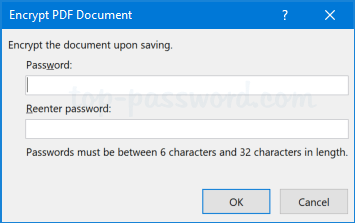 How to Password Protect PDF Document with Microsoft Word? 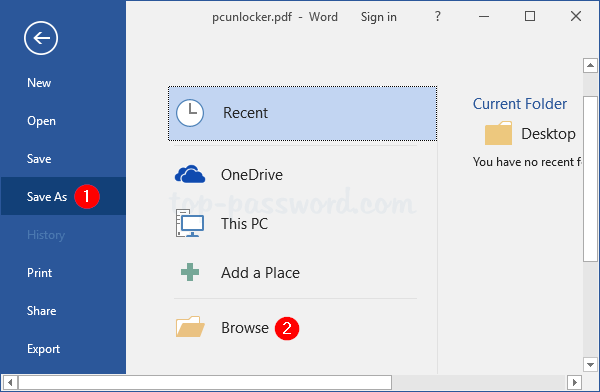 Create your document or open an existing PDF document using Microsoft Word. Click the File menu and then select the Save As tab. Browse to a location where you would like to save the PDF file. In the Save As dialog box that appears, select PDF (*.pdf) from the Save as type: drop-down box. Click the Options button at the bottom. At the bottom of the Options window, check the box next to “Encrypt the document with a password” and then click OK. Enter the password you want to encrypt the PDF file twice and then click OK. When you’re back to the Save As dialog box, enter a name for the PDF file and click the Save button. 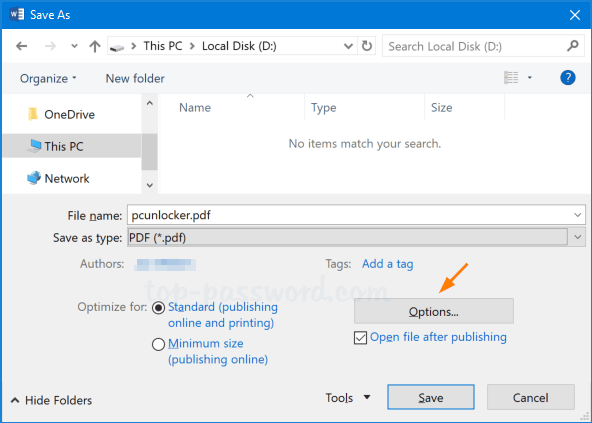 Now, if you open that PDF file with Adobe Reader or Microsoft Edge browser, you’ll be prompted to enter the document open password before you can view or edit it. Some updates may require you to reboot your PC and sign in to Windows to complete the installation process. 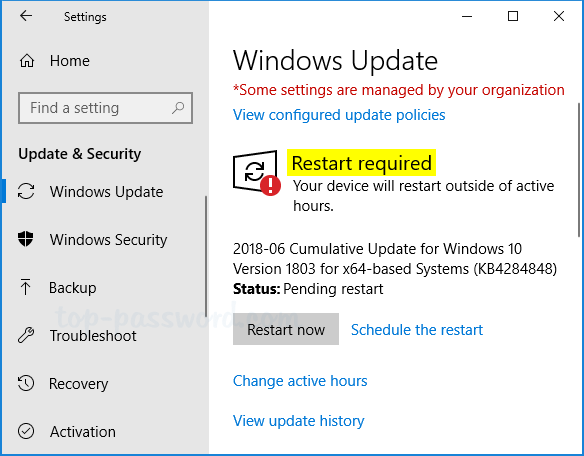 Since Windows 10 Fall Creators Update, there is a new setting that lets you auto log in to Windows temporarily when Windows Update initiates a restart. After finish setting up your PC, Windows Update will then lock your PC to help keep your account and personal info safe. Press the Windows key + I keyboard combination to open the Settings app. Click on the Accounts icon. Select the Sign-in options tab. On the right side, scroll down to the Privacy section and check the option labelled “Use my sign in info to automatically finish setting up my device and reopen my apps after an update or restart“. 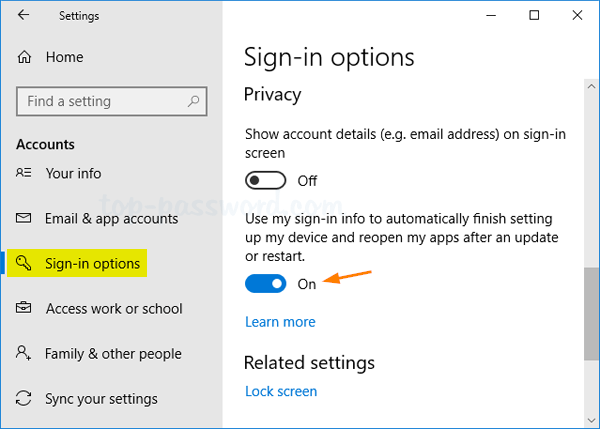 Now, Windows 10 will automatically sign in to your last account every time you restart your PC after Windows Update initiates a reboot. What to Do If You Can’t See the Above Option? 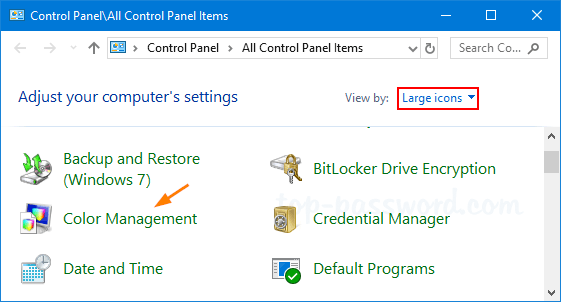 Open the Local Group Policy Editor and navigate to: Computer Configuration > Administrative Templates > Windows Components > Windows Logon Options. 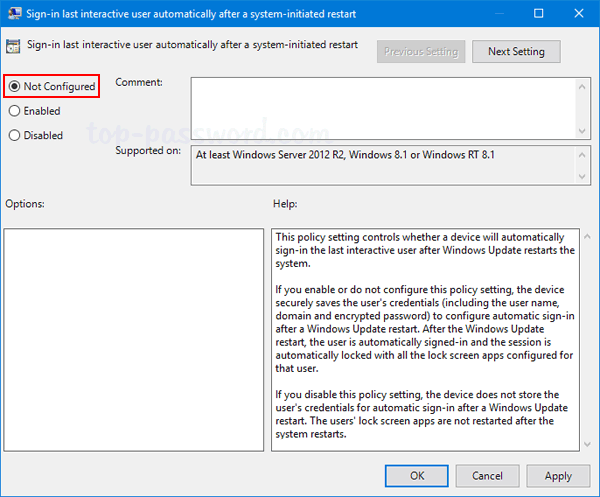 Double-click on the “Sign-in last interactive user automatically after a system-initiated restart” policy on the right side to edit it. Select Not Configured or Enabled, click OK.
After restarting your computer, the “Use my sign in info to automatically finish setting up my device and reopen my apps after an update or restart” option will be back in the Settings app. Additionally, you can also turn on “Use my sign in info to automatically finish setting up my device and reopen my apps after an update or restart” using a registry tweak. 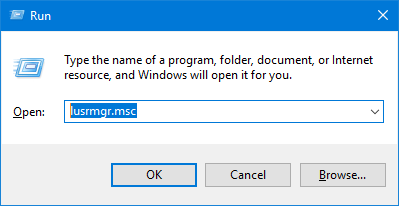 Just open Registry Editor and navigate to: HKEY_LOCAL_MACHINE\SOFTWARE\Microsoft\Windows NT\CurrentVersion\Winlogon\UserARSO, then expand the subkey named with the SID of your local account, change the DWORD OptOut to 0. 0: Turn on, 1: Turn off. Is there a shortcut to minimize all currently open windows at once? Of course, you can minimize each windows individually until all are minimized but this method is quite inefficient. 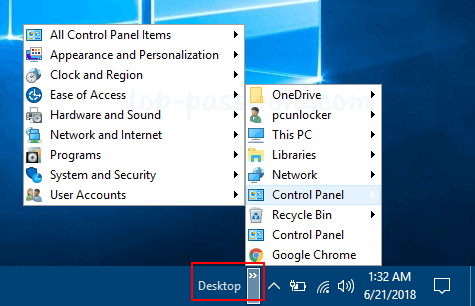 This tutorial will show you 3 quick way to minimize all open windows / applications running in Windows 10 / 8 / 7. 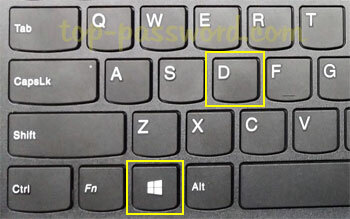 Simply press the Windows key and the D key simultaneously on your keyboard. This will minimize all the currently open windows at once. To restore minimized windows, press the Windows + D keyboard shortcut again. If you want to minimize all open windows except the one that’s currently active on your desktop, click on title bar of the window that you want to keep in the foreground, hold down your left mouse button and shake it (move left and to right very fast). The Show Desktop button is a small rectangular sectioned area on the far right side of Windows taskbar. Clicking the Show Desktop button will show you the desktop immediately, with all currently open windows minimized. When you click that button again, it will restore all the windows back onto the screen. 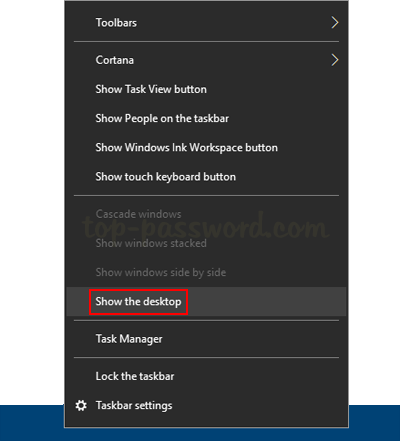 Just right-click an empty area in the taskbar and select the “Show the desktop” option from the context menu, it will minimize all open windows and and show the desktop. 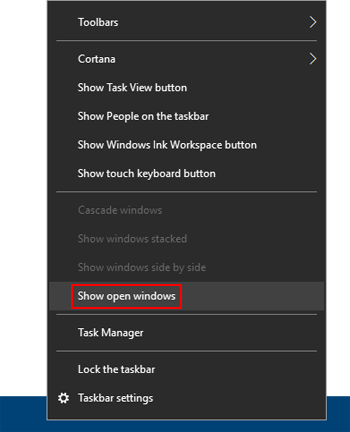 If you want to restore all minimized Windows to their original location, right-click on the taskbar again and this time you have to click the “Show open windows” option. 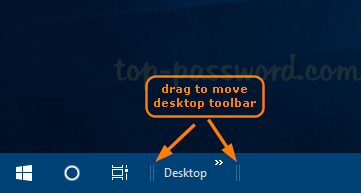 The desktop toolbar allows you to quickly access all shortcuts on your desktop, including Control Panel, This PC, Network, User Profile, Recycle Bin. 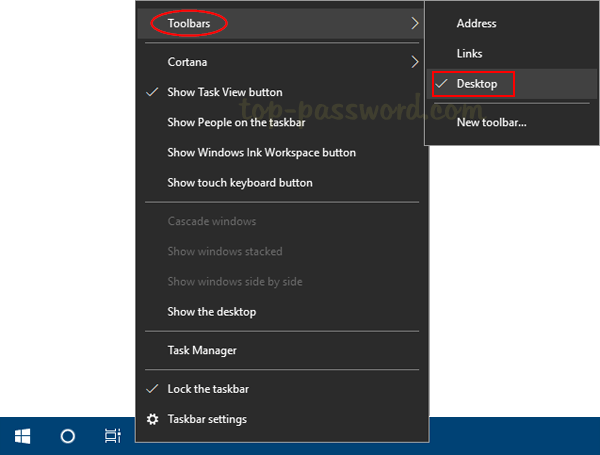 This tutorial will show you how to add the desktop toolbar to the taskbar in Windows 10, and move it to the left side of the screen. Right-click an empty space on the taskbar, and then select Toolbars -> Desktop from the popup menu. The desktop toolbar will appear in the taskbar, next to the system tray. Click the two little arrows >> on the right side of the desktop toolbar, and you can view all items located on your desktop in one long list. 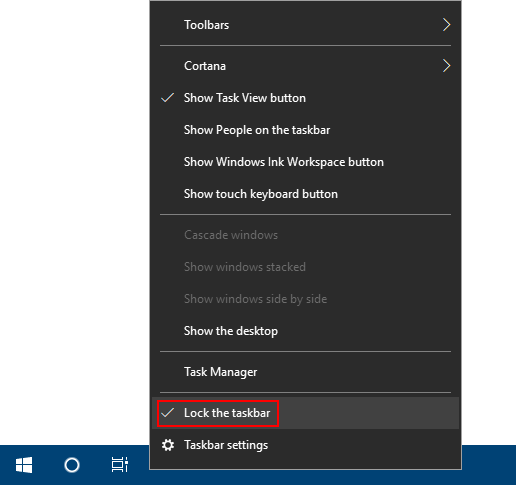 Right-click an empty space on the taskbar, click the “Lock the taskbar” option to uncheck it. Now you’ll see the dotted vertical divider on the left and right edges of the desktop toolbar. Just drag the divider to move the desktop toolbar to the far left side of the screen. Right-click an empty space on the taskbar, and then navigate to Toolbars and uncheck the Desktop option. 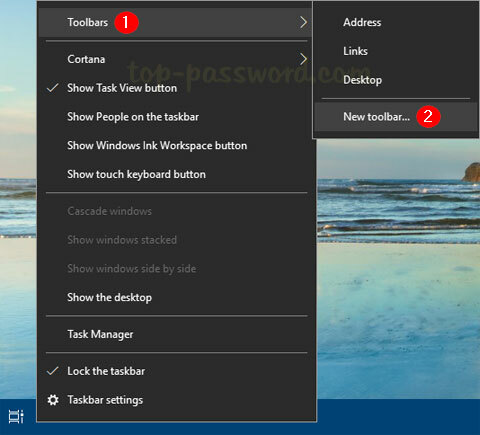 This will remove the desktop toolbar from Windows taskbar immediately. 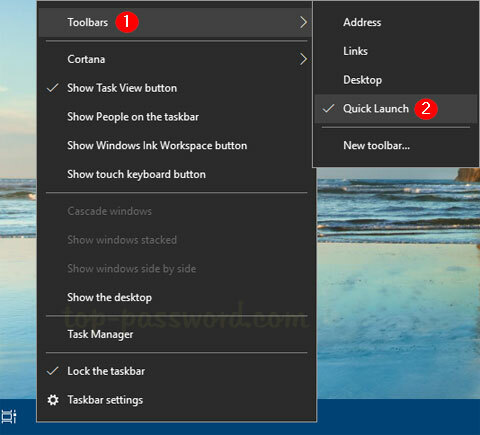 Quick Launch is a small toolbar that resides in your Windows taskbar that allows you to quickly launch programs that you place in it. Since Windows 7, Quick Launch toolbar was removed from the taskbar but you can get it back. In this tutorial we’ll show you how to enable Quick Launch toolbar in Windows 10/8/7, add your favorite programs to it, and move the Quick Launch toolbar to the left of taskbar. Simply right-click an empty space on the Windows taskbar, and then select Toolbars -> New toolbar. When the “New Toolbar – Choose a folder” window appears, paste the following path into the Folder field and press Enter. Then click Select Folder. Now, Quick Launch toolbar will appear on the far right of the taskbar. Press the Windows key + R to bring up the Run dialog box. Type the following path and press Enter. 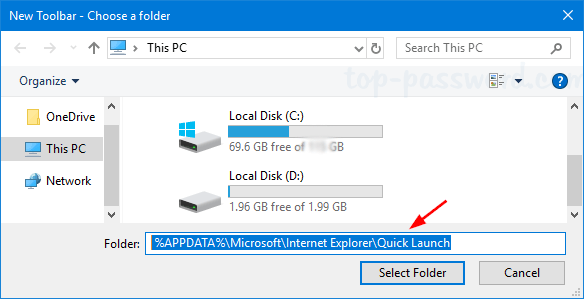 Windows Explorer will open the Quick Launch folder. Now you can drag your favorite applications or shortcuts and drop them here. When you’re done, your application icons will appear in the Quick Launch toolbar for quick access. If you want to move the Quick Launch toolbar to the left, right-click the taskbar and uncheck “Lock the Taskbar” from the popup menu. Click on the left edge (two vertical dotted lines) of the Quick Launch toolbar, and drag it over to the left as far as it will go. If you don’t want to use the Quick Launch toolbar any more, right-click an empty space on the taskbar, select Toolbars and click on Quick Launch to uncheck it. Now you’ve successfully removed Quick Launch toolbar from Windows taskbar. Recycle Bin icon is missing or disappeared after Windows 10 update? 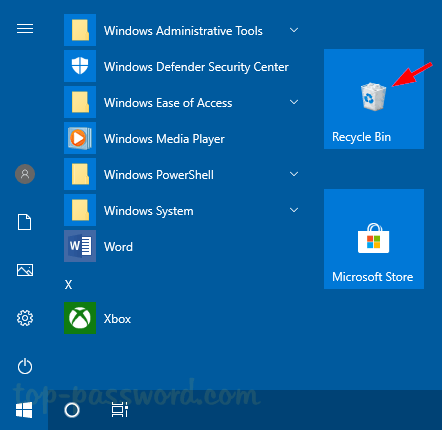 How can I get to the Recycle Bin without the desktop icon in Windows 10? 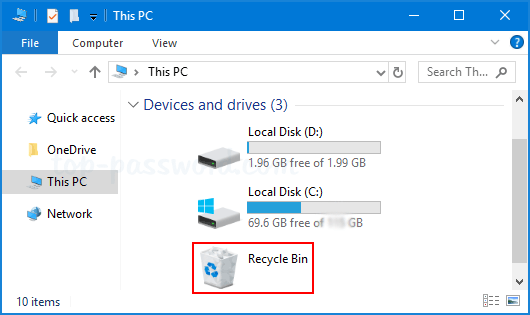 In this tutorial we’ll show you all possible ways to restore or open Recycle Bin in Windows 10. 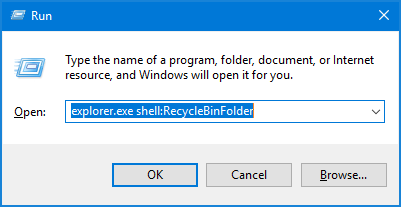 Open File Explorer then type “recycle bin” in the address bar. Press Enter to open Recycle Bin directly. 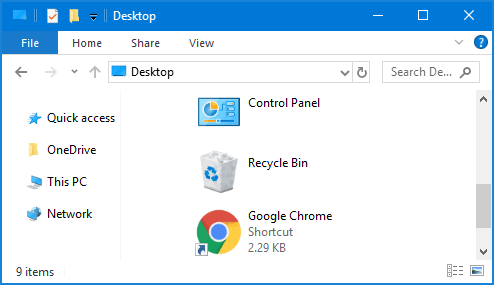 Another way is to click on the first “>” icon in the address bar to open a drop-down menu that contains all of the desktop icons, including Recycle Bin. 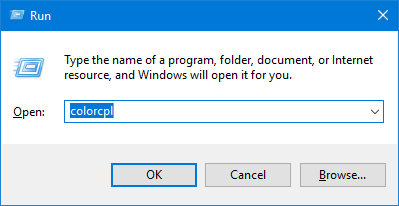 Use the Windows Key + R shortkey to open the Run prompt, type the following command and press Enter. This will launch Recycle Bin immediately. 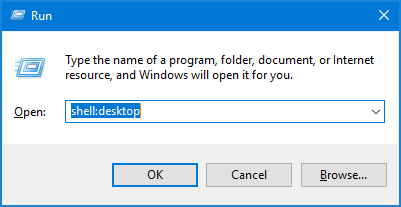 Use the Windows Key + R shortkey to open the Run prompt, type shell:desktop and press Enter. You can then access the Recycle Bin in a File Explorer window. 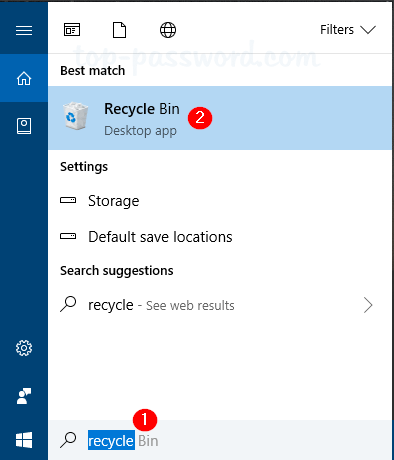 Click Start, type “recycle” and you can then open the “Recycle Bin” desktop app from the search result. Use the Windows key + I shortkey to open the Settings app. Navigate to Personalization -> Themes. 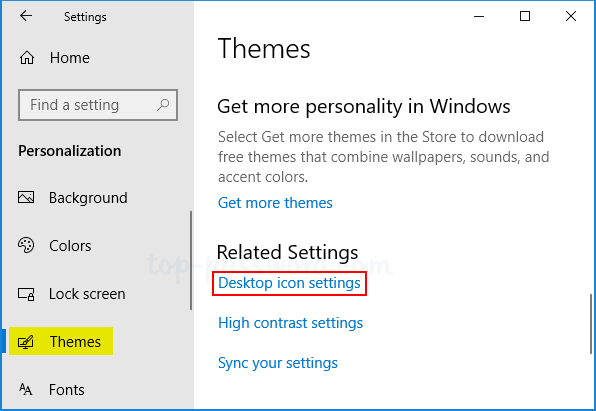 On the right pane, scroll down to the Related Settings section, and click the “Desktop icon settings” link. Select the check box for the Recycle Bin icon you want to appear on your desktop, and then click OK. 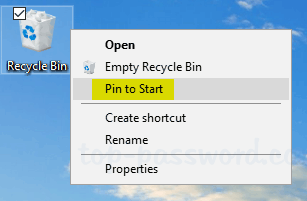 If you want to pin Recycle Bin to the Start Menu, just right-click the Recycle Bin icon on the desktop and then choose “Pin to Start“. You should see the Recycle Bin icon show up in the Start Menu as a tile. Open the Command Prompt as administrator. Type the following command and press Enter. When it’s done, open File Explorer again and go to “This PC” view. You’ll see the Recycle Bin shortcut. Have you ever accidentally quit your Word document without saving? How can I recover a Word document I was working on when my computer crashed or lost power? By default, Office automatically saves a copy of your document every 10 minutes using the AutoSave feature. 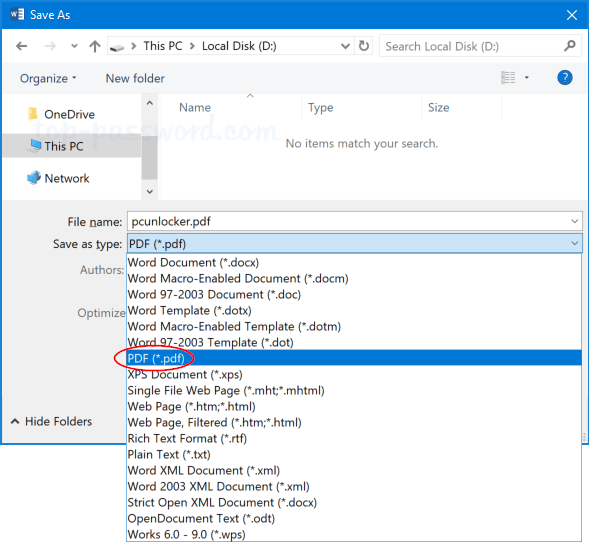 In this tutorial we’ll show you how to easily recover unsaved Word 2016 document in Windows 10. Open your Word 2016 application, and then click the File tab. Navigate to the Save tab on the left pane, and then look for the “Save documents” section on the right pane. Note down the AutoRecover file location. 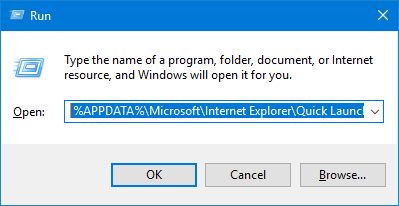 By default, it’s C:\Users\user_name\AppData\Roaming\Microsoft\Word. 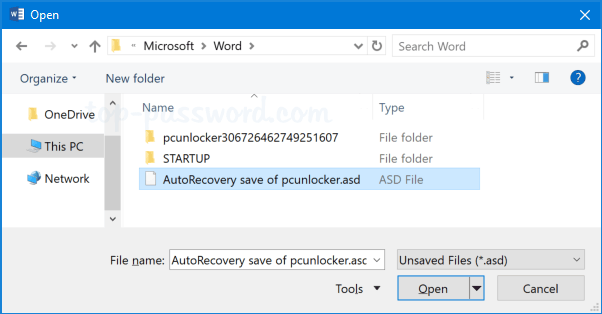 Now, open File Explorer and browse to the AutoRecover file location, you should see one (or more) files with the extension .asd. These are the Word autorecovery files. Open a blank Word document and then click the File tab. On the File menu, select the Info tab. 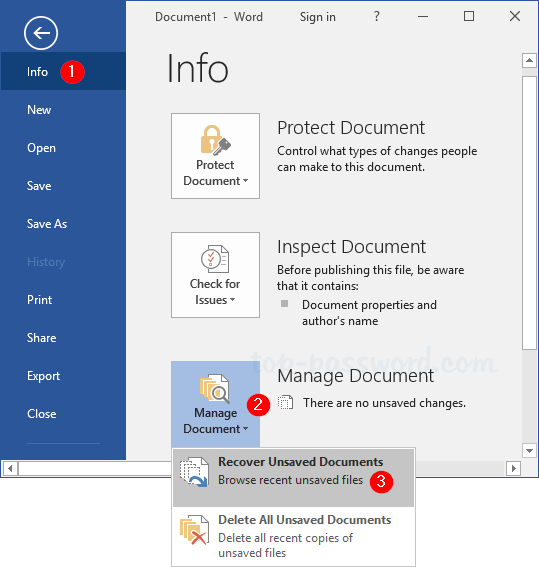 Click Manage Document, and then choose “Recover Unsaved Documents” from the drop-down menu. 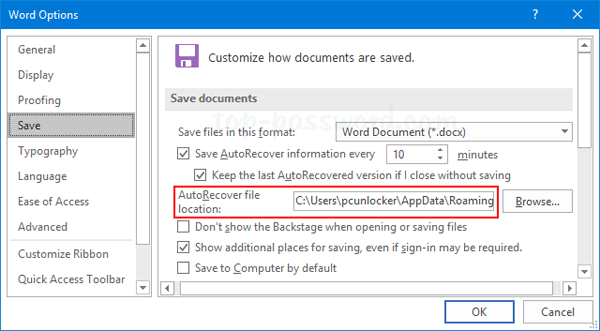 When the Open dialog box opens, browse to the AutoRecover file location. Select the appropriate .asd file and click Open. Voila! Your unsaved Word document is back, and at most you’ve only lost the last 10 minutes of work. Microsoft Store, formerly known as Windows Store, is built into Windows 10 which lets you browse and download millions of apps and games. 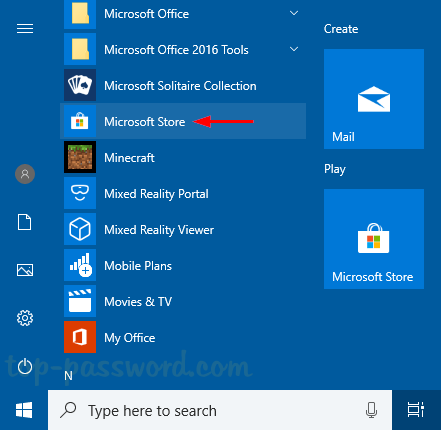 In this post we’ll show you 5 ways to open Microsoft Store app in Windows 10. Click the Start button. You can access the Microsoft Store app from both the left side of your Start Menu and the right side as live tiles. 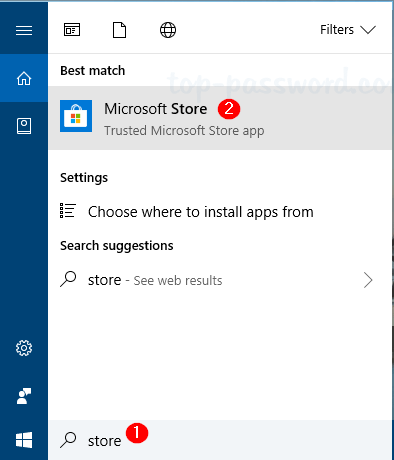 On the Windows 10 taskbar, type “store” in the Cortana Search box and you can open the Microsoft Store app from the search result. Press the Windows key + R on your keyboard, type “ms-windows-store:” without the quotation marks in the Run box that appears, and then press Enter. 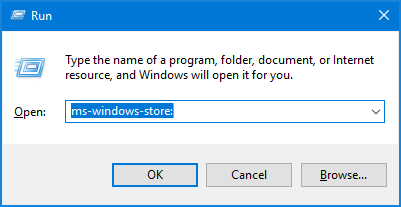 Another similar method is to open the Command Prompt, run the command “start ms-windows-store:” and press Enter. Alternatively, you can open PowerShell, type the same command and press Enter. 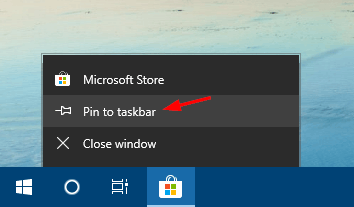 Once the Microsoft Store app is launched, right-click the program’s icon in the taskbar and select the “Pin to taskbar” option from the context menu. Every time you want to open Microsoft Store, just click the pinned shortcut in the taskbar and you can access it quickly.